Peter Lougheed Provincial Park is a provincial park located in Alberta, Canada. The park is situated in Kananaskis Country approximately 90 km west of Calgary, along the Kananaskis Trail. Peter Lougheed Provincial Park is a land of towering peaks, crystal clear lakes, forested valleys and glacial streams. 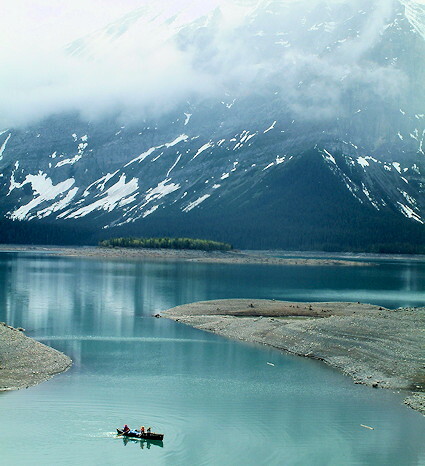 It is one of the largest provincial parks in Alberta, encompassing 304 km² around the Kananaskis Lakes. This park includes Highwood Pass, the highest drivable mountain pass in Canada. The park provides amenities for camping and fishing along with trails for hiking, mountain biking, horseback riding and cross-country skiing. Park visitors can hike or cross-country ski on some of North America's finest trails. Award-winning interpretive programs & numerous self-guided trails allow visitors to experience the area's spectacular mountain landscapes to the fullest. Some of the most popular backpacking trips in Kananaskis are found in Peter Lougheed Provincial Park. 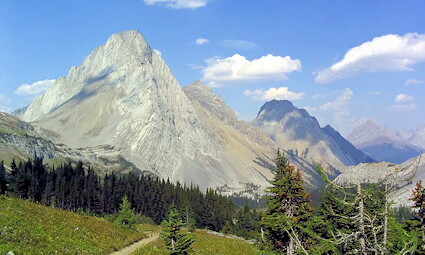 The Northover Ridge is a three to four day backpacking trip, as is the North & South Kananaskis Pass. There are currently six vehicular access campgrounds and six backcountry campgrounds in the park. Campsite reservations at Boulton Creek & Elkwood campgrounds, designated backcountry campsites and for group use only; Canyon, Interlakes, Lower Lake & Mt. Sarrail are "first come-first served". A variety of wildlife can also be found in Peter Lougheed Provincial Park, such as grizzly bears, black bears, elk, deer, moose, bighorn sheep, cougars, lynx, wolves and the occasional mountain goat.